Dr. Getty's December Tip: Why Don't Horses Have Gallbladders? Horses with plenty of pasture to graze 24/7. Add this to your collection of useful horse factoids that (surprise!) you actually needed to know: Horses don't have a gallbladder because horses are designed to eat constantly. We humans, on the other hand, eat few, relatively large meals. Our gallbladder serves as a storage pouch for bile -- the emulsifying agent produced by the liver that is needed to start fat digestion. When we eat a large amount of fat at one time, the gallbladder releases bile into the small intestine. If we didn't have a gallbladder and indulged in a high fat meal, we might experience indigestion. Horses, on the other hand, are trickle feeders -- they are supposed to continuously graze on forage, all day and all night long (virtually all the time, with a few minutes of napping here and there). The small amount of fat that they eat is easily managed by the liver. Therefore, there is no need to store bile in large quantities. 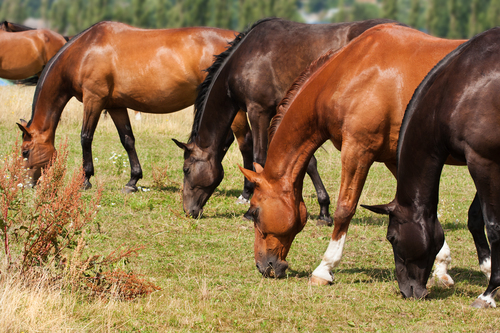 Horses don't have a gallbladder because horses are designed to eat constantly. In recent years, however, fat has been shown to be an alternative to high starch diets, since it is more concentrated in calories. There was initial concern that large amounts of fat would not be sufficiently digested. However, the horse’s liver has the ability to compensate. This adaptation takes several weeks; therefore it is best to slowly increase fat levels. 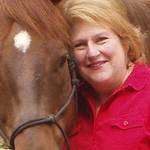 Juliet M. Getty, Ph.D. is an internationally respected equine nutritionist available for private consultations and speaking engagements. Beginning in 2013, Dr. Getty will be a regular contributor to the Horse Journal. At www.gettyequinenutrition.com, sign up for her informative—and free—monthly newsletter, Forage for Thought, read articles, search her nutrition forum, enroll in upcoming teleseminars and purchase previously recorded events. Contact Dr. Getty directly at gettyequinenutrition@gmail.com.